'Does the soul exist in modern society?' asks Jean Seberg's character in Godard's film A Bout de Suffle. LA resident, Julia Shamas Holter asks the same question and makes the sonic case for an affirmative answer. Music, and art in general, have always served as a sort of tuning fork for our personalities. We wouldn't survive without aligning ourselves with something that comes from a place of truth. And in times when that concept is seriously degraded, we need the kind of music that, with a true heart, carefully excavates whatever rings genuine from a vast inner hall of mirrors. Such is the music of Julia Holter – putting on masks to better grasp the truth beneath, defiling through a dazzling set of different, unfolding characters: while singing them into life, she is equally transcending and finding herself. As evasive to categorisation or comparison, as such singular and eclectic contemporary pop composer can get, Holter thinks of herself simply as someone who writes romantic songs. But far from reveling in emotional or sensual exaltations, her goal always reveals itself to be some kind of benevolent subversion. Holter seizes the means of musical seduction to lure listeners closer to truth; to deconstruct the fleeting feelings and re-think our romantic notions. Are we also in a post-true romance age? Has romantic love become something obsolete and anachronistic, risky investment in emotional cost-benefit analysis and unnecessary drama we would rather avoid? The greatest enemy of the capitalist plague of self-interest is love, and while nobody would picture Holter's intricate musical enchantment as revolutionary call to arms, to reaffirm love and depth, to charm unawakened souls is to fight a good fight. Holter's soul archaeology is capable of inspiring much-needed seismic shifts in our internal landscapes, before we can hope for any external changes. Holter's latest recording, In The Same Room, named after a song from her second, Ekstasis, continues on the aesthetic progression of the two most recent albums, exploring more delicate and fluid nuances of sonic romanticism. With this record, she has the honour (or task) of opening the new live studio sessions format on Domino's infant Documents imprint. Inspired by legendary BBC sessions, a series of irregular live recordings will follow evolving arrangements of their touring artists. 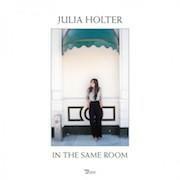 Anyone acquainted with Holter's live performances will be well aware of their uniqueness, variety, rearrangement and paradoxical sense of highly controlled spontaneity – always leaving room for her tremendously flexible band to improvise on a whim. Musicians featured here are Corey Fogel - drums/vocals; Dina Maccabee - viola/vocals and Devin Hoff - stand-up bass, shaping her bedroom recordings into orchestral compositions on a lush and dynamic spectrum. As on Have You in my Wilderness, Holter's impeccable vocals are at the forefront, evolving from composer's eloquent use of voice as acoustic instrument, with striking musicianship as vocal author, into a singer perfecting the craft. In The Same Room gives us more intimately friendly insight into the beguiling world of Julia Holter, seen here as thoughtfully poised and careful not to intimidate the listener, making this breezy recording a good entry point for novices in Holter's catalogue. Superbly recorded at London's RAK studios over the course of two days, immaculate performances, while not offering the many radically re-arranged renditions that Holter's fans might hope for, show cleaner, decluttered, even-tempered arrangements full of nuanced craftsmanship and sublime melodic harmony, while not lacking in cathartic finales. The intensely intoxicated atmosphere of the original albums is replaced with spacious and elegant, subtly illuminated minimal sound of unashamed beauty, captured here on the finest quality recording of Holter's music to date. The first notes of an unrecognisably slow-paced 'Horns Surrounding Me', with intriguing background interplay of a purely classical set of instruments, suggest a certain sacrifice of power to harmony, that underlies this whole session. The instruments are no longer chasing the poor subject, who has now found peace, reflected in Holter's almost ironically languid vocal delivery, erasing anxiety of the original version and perhaps rightfully reminding us of 'how soft a heart is'. The preciousness of her poetics is remarkably captured in high fidelity, but cinematic depth of sound is lost: Holter's songs are like audio scripts for masterpieces of poetic cinema that don't exist, inspired by bits and pieces of previously existing stories, made into imaginary soundtracks where music is not descriptive background, but the movie itself. “I’m basically into creating movies that are albums as opposed to albums that are like sound from movies,” Holter herself once remarked – though it's worth noting that she also recently soundtracked the new Miles Teller film, Bleed for This. Holter has always been a conceptual storyteller more than a confessional songwriter, so as a whole, this set lacks a greater unifying conceptual frame to give it the cohesive power of purpose. But individual renditions do stand out: the excellent rework of Tragedy's 'So Lilies' shows us how a song is built up from scratch, starting as bare; the echoed vocal interplay of Holter and her viola player Dina Macabee, riding on the skeleton of Reichian minimalism, a percussive build up gradually fleshing out the song into a supremely harmonious flow with medieval accents that accelerate to a discordant finale. 'Lucette Stranded on The Island' and 'Betsy On The Roof' are emotional highlights of great empathy towards these female characters. There is unusual resonance in Holter's work with specific female experience, under represented in critical discourse and sometimes unfairly maligned in that part of mass feminist tradition, that – in a hurry to become part of male, logocentric symbolic order – ignores the complexities of individual subjectivity. Focusing on feminine condition as a group, it rushes to erase gender differences and appropriate everything to social conditioning, before doing the inner work of self-realisation and full acceptance, needed to strengthen feminine identity and balance the polarities. Any essentialism aside, while not being exclusive to biological womanhood, the French feminist school of thought points to 'L'ecriture Feminine': specific feminine psycho-sexual order, rooted in the semiotic microcosm of fluidity, stream of consciousness, playfulness etc. – all strong hallmarks of Holter's impressionistic art, in which she deeply internalises everything around her and transforms introvert anxieties into highly articulated poetic amusement. Always triumphing against the world limiting her self-expression. The French philosopher and psychoanalyst Julia Kristeva explored, in depth, this still-alien concept of feminine genius in her trilogy on three remarkable women – one of them Holter's great inspiration Colette, the writer. And there are parallels one can draw between the particular artistic languages of Colette and Holter: they both inscribe their singular identities into their art and create a unique alphabet of tactile, fragrant, sensory worlds made into thought. Both Holter and Colette meet in poetic regions of thought where sense and sensuality, ideas and instincts, are joined. Poeticism of language, rather than its rhetoric function interests Holter: whilst oblique and never explicitly subjective, she captures the universal value of her unique experience, otherwise hidden; her voice illuminates darkest corners of her wilderness, she navigates with felicity and curiosity, serving as a tool of reclaiming her total self. One of the more interesting re-inventions of the voice can be found in the stretched out dynamics of 'Vasquez', with warped vocals going trough some kind of a rebirth midway. Kristeva sees female experience as tied to rebirth, in non-linear temporality from the perspective of the cyclical economy of the female body, in which life is not a linear march from birth to death. Holter's song structures follow meandering logic of rebirth and reinvention – her art is full of profound estrangement that can be read as experience of feminine decentralised perspective, emerging into male logocentric symbolic order, where she is a stranger and outsider, a community she is a part of but doesn't belong to. Holter makes such displaced perspective her greatest strength.